Hood doesn't get a whole lotta love on this blog, mainly because they crank out low quality stuff for those on a tight budget. However, I like to be fair and check in now and then. 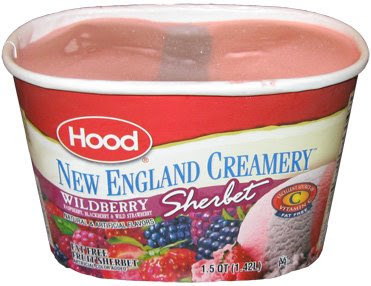 Since I was in need of some sherbet, I decided to try Hood's Wildberry sherbet (which was on sale of course). On the left is the raspberry, the thin strip in the middle is the blackberry, and on the right is the wild strawberry. My first few bites were of the strawberry and I thought "hmmm, this isn't too bad". I guess Hood can't mess up sherbet....or can they? I took a bite of the purplish blackberry and realized it was kind of flavorless. That's odd, but maybe that's why there is only a thin strip of the stuff. That leaves raspberry, my favorite sherbet flavor, I'm sure it will taste....just awful. Ewwww, what have they done? It tastes like that whacky raspberry fluff I bought, only diluted with fat free milk. oh, it's unpleasant. I tried mixing them all together, but I had already eaten too much of the strawberry to save the overall mix. So, I'm disappointed. Actually, can you be disappointed when you expect it to be bad? Oh well. I'll finish off the strawberry portion, and then I'm done with this stuff. On Second Scoop: I had a quick bite and I realized I was a little rough. The strawberry is fine like i said, the blackberry is very mild, and the raspberry is...ummm...it's ok I guess, it's just not where I like it to be, so I just can't enjoy. Maybe some of you will, but I can't. On Third Scoop: I've been trying to get myself to finish this container and I just can't do it...yuck, boring, yuck. If u like wildberry sherbert try Friendly's. IF you can find it.